This is an Italeri model kit of the M24 Chaffee packaged in a Tamiya box with Tamiya instructions, plus a figure, a host of accessories, and even new and remolded parts. 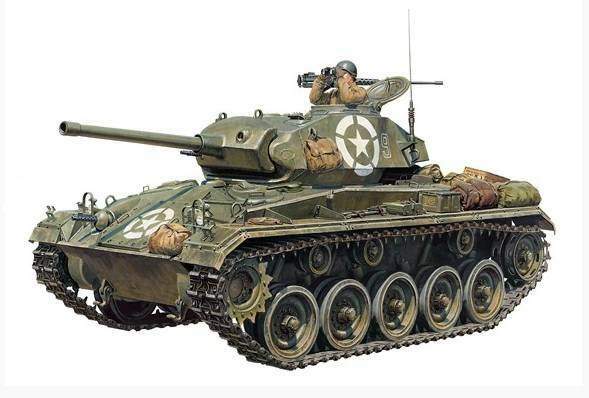 The M24 Chaffee was officially adopted in 1944 as a successor to the M3/5 Stuart light tanks. It was equipped with the compact 75mm gun (originally developed for the B25 Mitchell bomber) and - somewhat unusually for a U.S. AFV - torsion bar suspension. It made it into service in Europe before the cessation of hostilities in WWII, and served on and on through the Korean War and - in some places - even into the 1980s.